After ending the season with a 14-2 record over the final 16 games, the last thing I expected was a first-round exit for the San Antonio Spurs. That second loss was a huge one on the last day of the NBA season. Falling to the New Orleans Pelicans not only got them into the playoffs, but it dropped the Spurs from being a two-seed to a number six-seed and starting the first round series on the road. Even with that said, I did not expected them to lose to the Los Angeles Clippers. After destroying the Clippers by 27 points in game three and taking a 2-1 lead, I thought the series was over. 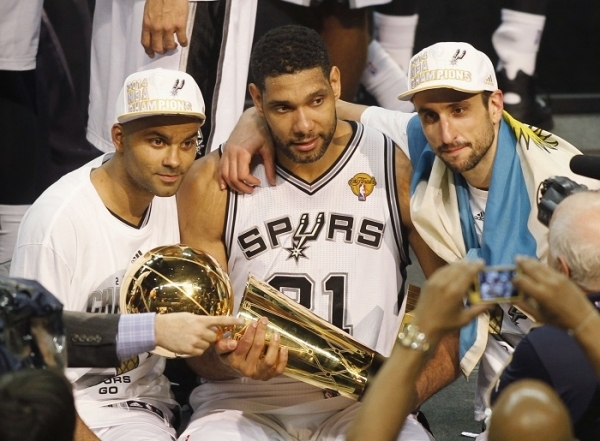 When they won game five in L.A. and took a 3-2 series lead going back to San Antonio, I thought it was over. People can talk about the questionable foul call against Tim Duncan on Chris Paul late in game seven. They can talk about the clock operator starting the game clock before the Spurs inbounded the ball. The fact remains the Clippers did earn that series win. But more importantly, with Duncan, Manu Ginobili and Danny Green being impending free agents, what will the Spurs look like next year? San Antonio currently sits at $33.7 million for next season but that does not include the qualifying offers to Leonard, Joseph and Baynes. Clearly the Spurs will extend the qualifying offer to Kawhi and make him a restricted free agent. Expect him to get a salary in the five-year, $90 million range. That would presumably leave them with about $17 million in cap space. I would let Danny Green and Ginobili walk. Neither of them is worth using their cap space on. Especially Ginobili at his age and clear decline in ability. Green is a nice player and should certainly thank the Spurs and Gregg Popovich for even being in the league today, but I would just prefer to use the money elsewhere then sign a guy who’s a walking turnover every time he puts the ball on the floor. Same goes for Cory Joseph and Aron Baynes, let those two guys walk. With Patty Milles healthy Joseph is expendable. And Baynes was thoroughly destroyed in that series against the Clippers. The biggest obstacle on the Spurs salary cap is the $8.5 million tied into Tiago Splitter. That was an awful contract when San Antonio agreed to give it to him entering the 2013-14 season and it looks far worse now. And it may even cost them signing LaMarcus Aldridge in the off-season. The Spurs will have to get creative, but if they can add Aldridge and partner him with Wesley Matthews to fill the Danny Green void and bring much more to the table, then the Spurs are going to be back as a legitimate threat next season. One thing that really hurt them in the series against the Clippers was the lack of bigs that deserved to be on the floor more than five minutes. Splitter and Baynes were terrible the entire series, and Duncan shouldn’t be relied upon as much as he was. Even if he’s still as good as they come. Another way to get creative in creating cap space is to try and convince Leonard to take less than max money, maybe even just a two or three year deal, to give the team the capabilities of signing Aldridge, retaining Duncan and still give him a handsome raise while reassuring him the opportunity to get a lot more money in a few seasons with the new CBA. If San Antonio comes back with mostly the same group, they’ll still be good but the championship days may be over with the strength of the Western Conference. But if they can figure out a way to add Aldridge and Wes Matthews and bring back Duncan and Leonard, it’s a whole new ballgame. Reblogged this on Jay's News Feed!.